In March of this year, Frango Grille USA, Inc. (“Frango”) commenced a legal action against Pepe’s Franchising Limited and several of its officers, employees, and affiliated companies (collectively, “Pepe’s”) arising out of a failed franchise relationship. Pepe’s, a United Kingdom company headquartered in Herts County, England, is the franchisor of a quick service chicken restaurant chain operating under the name Pepe’s Piri Piri. Frango is a California corporation with its principal place of business Los Angeles, California. In early 2012, a representative of Frango visited Pepe’s headquarters to discuss a relationship that would allow the parties to build the Pepe’s brand in California. Following a year of extensive negotiations, on February 21, 2013, Frango and Pepe’s entered into a Master Franchise Agreement (the “MFA”) granting Frango the right to open and operate a Pepe’s Piri Piri restaurant in California, and to recruit other prospective franchisees in California. The honeymoon period for Frango and Pepe’s quickly faded, and without opening a single Pepe’s Piri Piri restaurant, Frango filed a lawsuit against Pepe’s with the District Court in the Central District of California. 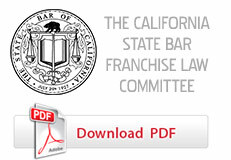 The seven-count complaint included five separate violations of the California Franchise Investment Law (the “CFIL”) and two claims for fraud. Pepe’s moved to dismiss on grounds of forum non conveniens or, in the alternative, to transfer the case to London. Replying upon the forum selection clause in the MFA, Pepe’s argued that London was the only proper forum for the lawsuit. Frango opposed the motion on the grounds that the out-of-state forum selection clause is invalidated by the CFRA at Bus. & Prof. Code § 20040.5. In ruling on Pepe’s motion, the court first considered the applicability of the CFRA to the dispute. Pepe’s argued that the CFRA did not apply in this case because (1) Frango was not “operating” a franchise in California as required under the language of Bus. & Prof. Code § 20040.5, and (2) Frango did not bring any claims for violation of the CFRA – only claims for violation of the CFIL and fraud. The court next turned its attention to Pepe’s primary argument – that the CFRA provision cannot override the forum selection clause in the MFA in light of the U.S. Supreme Court’s recent decision in Atlantic Marine. Although recognizing that “most of the MFA negotiations took place in England,” the court denied Pepe’s motion to dismiss finding that Pepe’s (1) decision to do business in California, (2) registration to do business in California, (3) knowledge that the forum selection clause was not likely enforceable under California law, (4) knowledge that “disputes arising out of or concerning” the parties’ contracts and relationship would be litigated here. Cal. Bus. & Prof. Code § 20040.5 provides that, "A provision in a franchise agreement restricting venue to a forum outside this state is void with respect to any claim arising under or relating to a franchise agreement involving a franchise business operating within this state. (a) For the convenience of parties and witnesses, in the interest of justice, a district court may transfer any civil action to any other district or division where it might have been brought or to any district or division to which all parties have consented. (b) Upon motion, consent or stipulation of all parties, any action, suit or proceeding of a civil nature or any motion or hearing thereof, may be transferred, in the discretion of the court, from the division in which pending to any other division in the same district. Transfer of proceedings in rem brought by or on behalf of the United States may be transferred under this section without the consent of the United States where all other parties request transfer. (c) A district court may order any civil action to be tried at any place within the division in which it is pending. (d) Transfers from a district court of the United States to the District Court of Guam, the District Court for the Northern Mariana Islands, or the District Court of the Virgin Islands shall not be permitted under this section. As otherwise used in this section, the term "district court" includes the District Court of Guam, the District Court for the Northern Mariana Islands, and the District Court of the Virgin Islands, and the term "district" includes the territorial jurisdiction of each such court.